→What is Buck Fever? What is the Best Way to Cure It? You see the perfect buck cross your path. You lock it in your sight, aim your bow, and prepare to take your shot. You suddenly feel sweaty, your hands start to shake, and when you fire your arrow, you miss the buck from ten yards away. If you’ve had a similar experience to this, chances are that you’ve suffered from buck fever. This is a common condition that even the most seasoned bowhunters may experience at one time or another. So what is buck fever? What causes it? Is there any way to cure it? Today we will learn more about this condition and find ways to minimize its negative effects on your hunting experience. What is Buck Fever? What Causes It? Buck fever sometimes occurs when you spot a target and become too nervous and excited about shooting it. Because of this, your body will produce too much adrenaline, causing you to sweat profusely, shake uncontrollably, and more likely to miss your shot. Mild symptoms of buck fever may range from shaky hands to sweaty palms, while more extreme cases may lead to chest pains, hyperventilation, and ever an increased blood pressure. While you may think that getting buck fever is an embarrassing experience, you really shouldn’t worry too much about it. Most bowhunters go through it at least once, and even when you do, there has been no known lasting side effect from it. 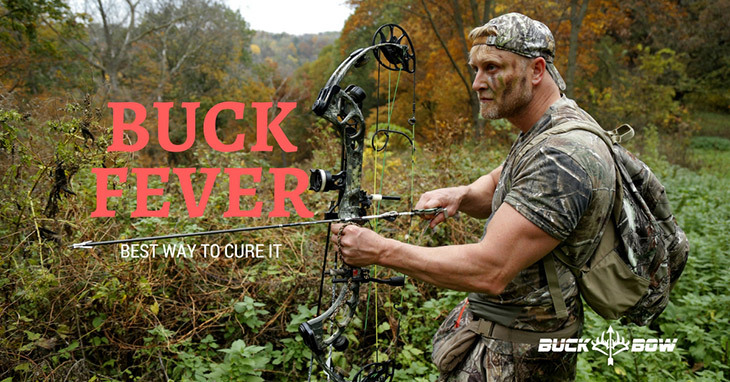 How Do You Cure Buck Fever? Admit that you are prone to it. The best way to deal with a problem is to accept that you have a problem in the first place. Admit to yourself that you sometimes get too anxious or excited before making a shot and this sometimes affects your accuracy. Only then can you start working on how to solve your problem. Cut down on caffeine. I’m sorry to say this, guys, but if you’re prone to buck fever, you may need to reduce your caffeine intake weeks before you plan to go bowhunting. Caffeine has the tendency to give people the jitters because it stimulates the nervous system and makes you prone to shaking. When cutting down on caffeine, I recommend taking it slowly, over the course of two weeks (or more! ), unless you’re willing to go cold turkey, which could be an excruciating experience. And don’t just cut back on your coffee or tea intake—be mindful of soda and other carbonated drinks, as these are usually loaded with caffeine, too. Practice, Practice, Practice. One of the ways I avoid buck fever is practicing religiously on and off the hunting season. If you can’t do it in the field, then try to find a good target archery place that offers 3D targets, to help you get a feel of how to shoot bucks and does in real life. If you have your own target range at home, I suggest moving your practice target to different spots at different points of the day. This will stop your brain from being too familiar with shooting on just one spot, which will help minimize your chances of getting panicky when you finally go to your hunting grounds. Another helpful tip I learned is to wear your hunting clothes during target practice. While it may seem funny at first, I’ve found that this is actually helpful because you’re basically familiarizing your body to the feel of your clothes which you will wear during your actual bowhunting trip. Psyche yourself. Mind over matter is a famous line and for good reason. Your mind could be a powerful ally and help you prepare your body for the big day. While practicing your aim and preparing your body are important, it is also essential that you psyche yourself for your trip. Imagine yourself shooting that buck from 70 yards away and making a clean hit. Picture yourself bringing home your trophy and having a great hunting experience. Doing these things may help you overcome your nervousness and prepare yourself better for your actual hunting experience. Make surprise shots. If you find yourself prone to buck fever, then you may want to use a bac﻿﻿k﻿﻿ tension﻿﻿ release during your trip. Because of this release’s design, you have little to no control of when your shot will be fired, so there is a smaller chance that you will miss your shot. Using a back tension release will also make you more conscious of your muscles when pulling your bow. When you’re more focused on how you need to tighten your muscles slowly, you usually end up paying less attention to the actual shot, and you don’t get the chance to panic before the arrow flies off. Split your shot into two parts. You can also try splitting your shot into two parts: First, aim your bow, and second, make the actual shot. Let me explain it more clearly. Before taking a shot, you should condition your mind into thinking that you have two different tasks. Your first task is to aim the bow and lock in your target in your sight. When you finish this, tick off this task in your mental checklist and proceed to the next task: Make the actual shot. By doing this, you’re allowing your brain to be more focused and occupied. Also, when you break down your activity into smaller, easier steps, you decrease the possibility of feeling nervous over it. Buck fever may happen to the best of us, but this doesn’t mean we shouldn’t do anything to prevent it from happening. Start preparing in advance by reducing your caffeine intake, psyching yourself mentally, and of course, practicing every chance you get. Then during the actual hunt, you can aim for surprise shots and split your shot into two individual tasks. Did this article help? Do you have other techniques you use to cure buck fever? Let me know in the comment’s section below. Let’s help each other!